What if I created something every day for a year? Day 31. Today I'm publishing something that I actually made a while ago but never formally released publicly. Several years ago I attended a workshop for teaching English skills and the task set for us by the presenter was to write a couple of paragraphs of a fairy tale using the biggest words we could. 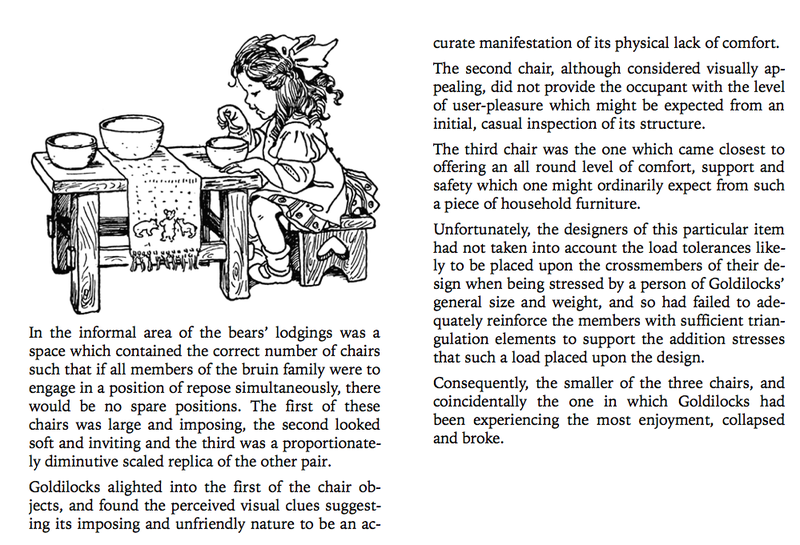 I enjoyed the task so much that I went home and finished the whole story of Goldilocks and the Three Bears, and filled it full of the biggest, longest words I could think of. And then I used Adobe InDesign to make it into an eBook, just for fun. Anyway, if you're interested, you can click this link to get an ePub version of the story that you can download and read on an eBook reader. Day 30. 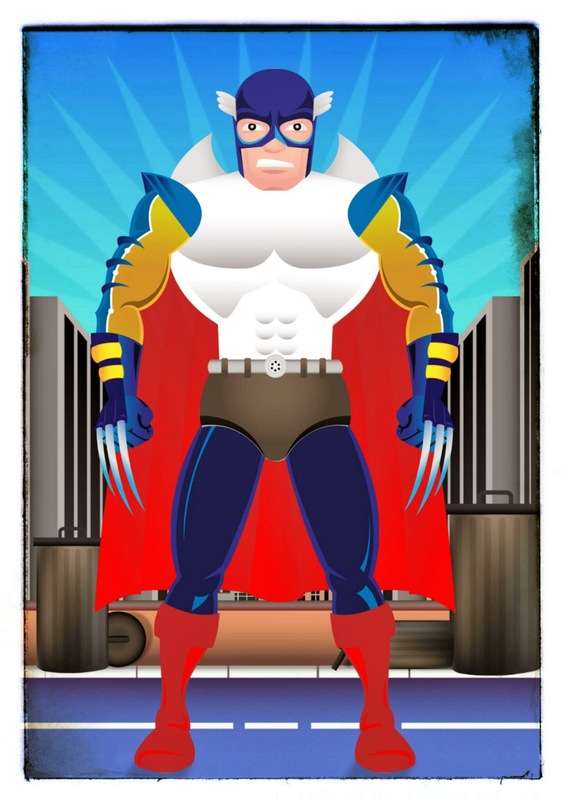 This simple little cartoon was created using an Android app called Make a Superhero. 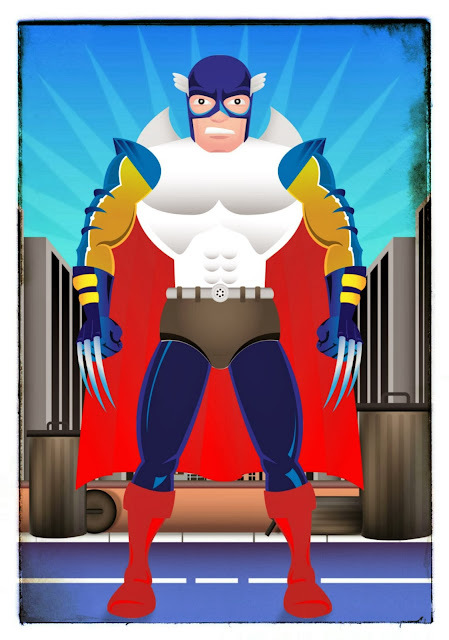 It lets you mix and match superhero body parts - heads, arms, legs, etc - with different costume parts to design your own character. It's simple, but a bit of fun. After making it I dropped it into SnapSeed just to filter the colours a little, then posted it here using the Blogger app for Android. Day 29. This little video was shot just outside my house using an app called MegaPhoto+. The app is actually a collection of hundreds of really interesting photo and video effects that can be applied directly in-camera and rendered live. For students making videos in class I can see lots of possibilities for making their videos more fun and interesting. Day 28. Back to school! It's apparently my annual birthday present... every year I seem to resume work on my birthday. Anyway, I was sitting in a staff meeting this morning and snapped a photo using an iPad app called Paper Camera. 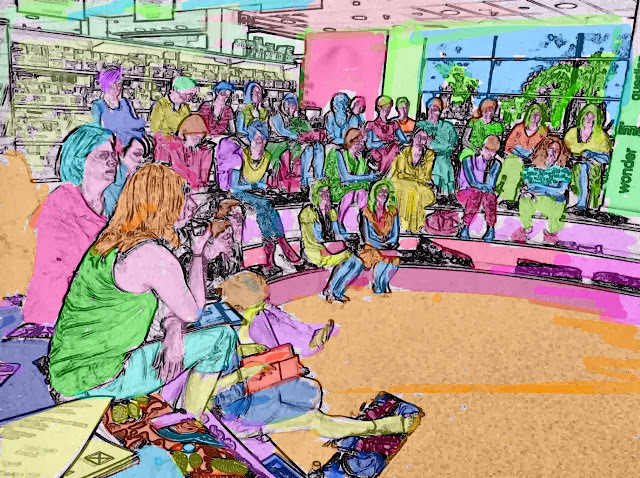 It does a line art treatment to the photo, and then I opened it in Photoshop Touch, duplicated the layer and hand painted the line art with brushes set to low opacity. Sitting at my desk, weird things sometimes happen. This is the true story about the forbidden love between an Android phone and an iPad VGA adapter. Now let us never speak of it again. Day 26. Australia Day. 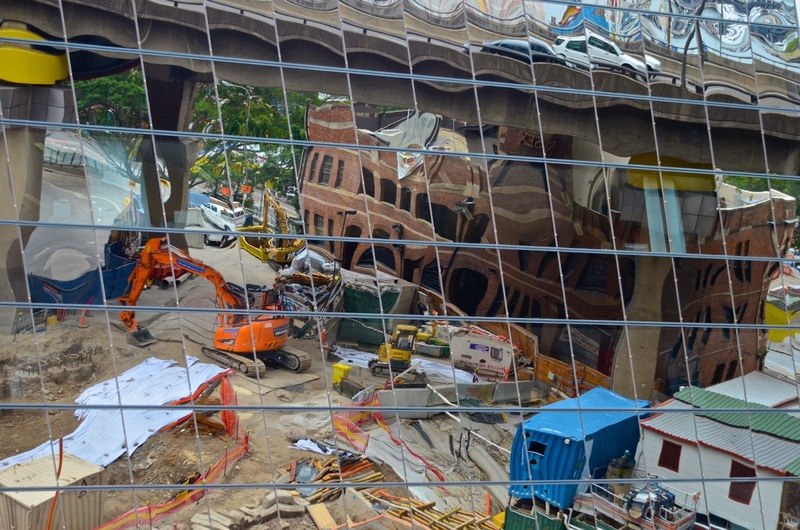 Driving into the city to meet friends today I spotted this building site on the corner of Kent and Napoleon Streets. 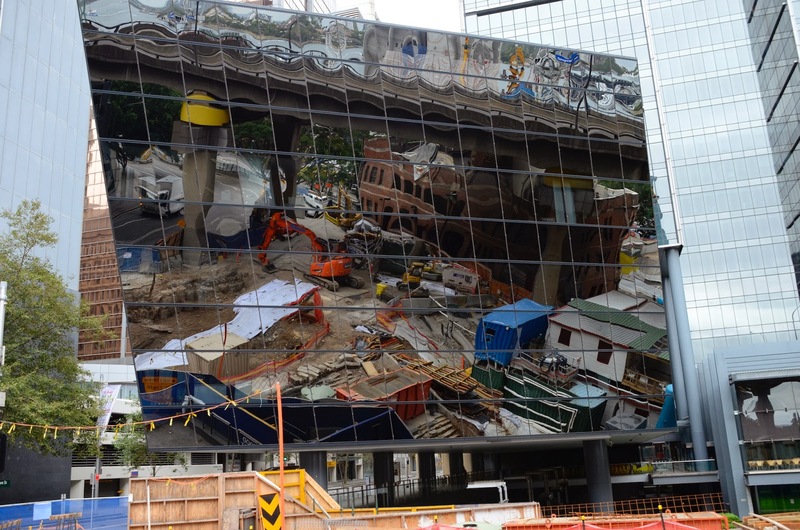 It was right next to an existing building that was made entirely of mirrored glass, reflecting the construction area below it like a 10-story-tall photomosaic. It was quite visually stunning actually. I pulled over, jumped out with the Nikon D7000 and snapped it for today's daily create. Hope you like it. 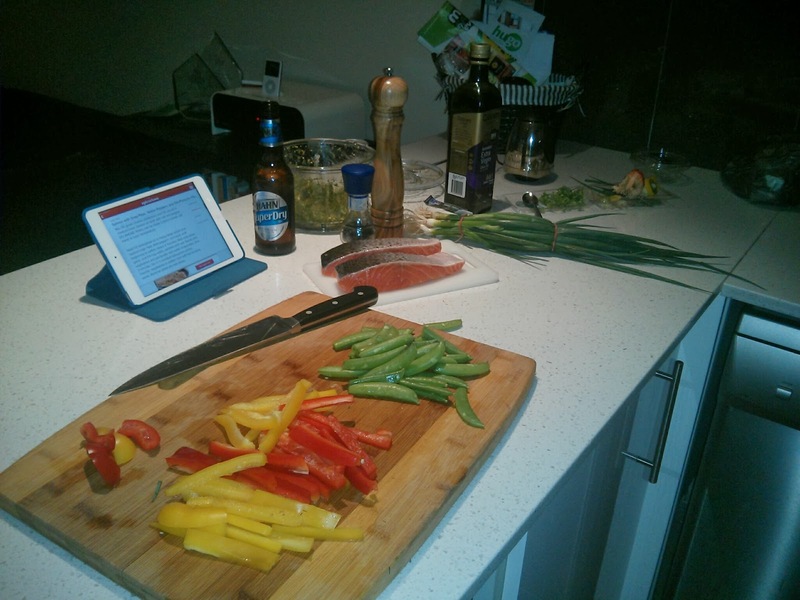 I must admit that I do enjoy the creativity involved in making a meal... the chopping, mixing, tasting, cooking, etc. Oh, and it was rather delicious too! 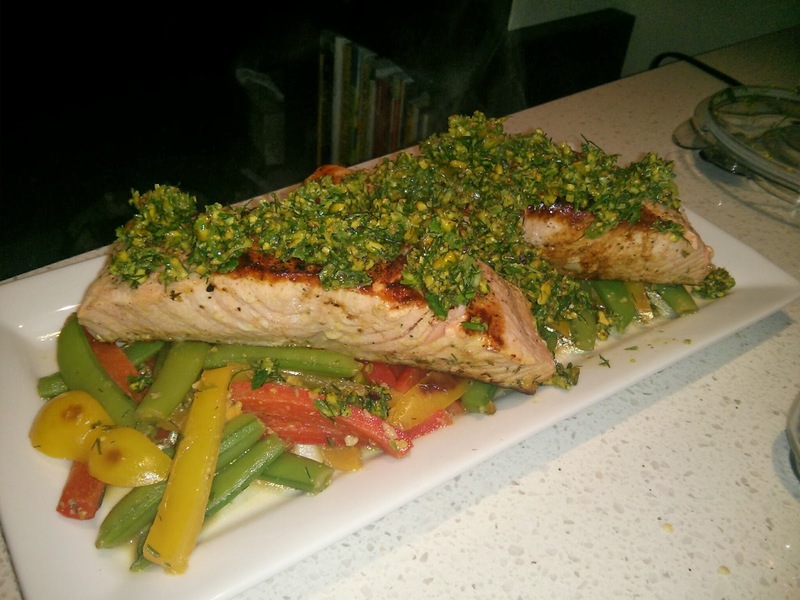 What do you think, is it ok to count cooking as the occasional daily create? Day 24. The world recently said goodbye to the late great ex-president of South Africa, Nelson Mandela. Just because I enjoy verbal and visual puns, I've created a mandala - a circular patterned design - out of flower images to look like a floral wreath, around Mr Mandela's portrait. The mandala design was created using an iPad app called Mixala. 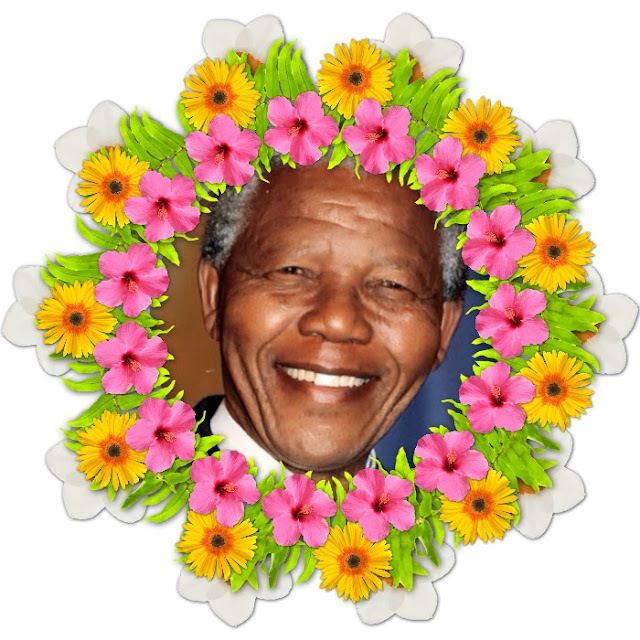 Portrait of Mandela was found using Google Images. Day 23. Today's create is a downloadable TrueType font, based on my own handwriting. Using an app called iFontmaker, I created a full set of 98 glyphs, which includes upper and lower case alphabets, numbers and symbols. You can download the TrueType .ttf file, install it into your font collection and then enjoy typing with the same messy handwriting that my teachers criticised me for all through school! Cool huh? Just click this link to go to the download page and get a copy. And seriously, if you do end up installing it, I'd love to hear from you in the comments. 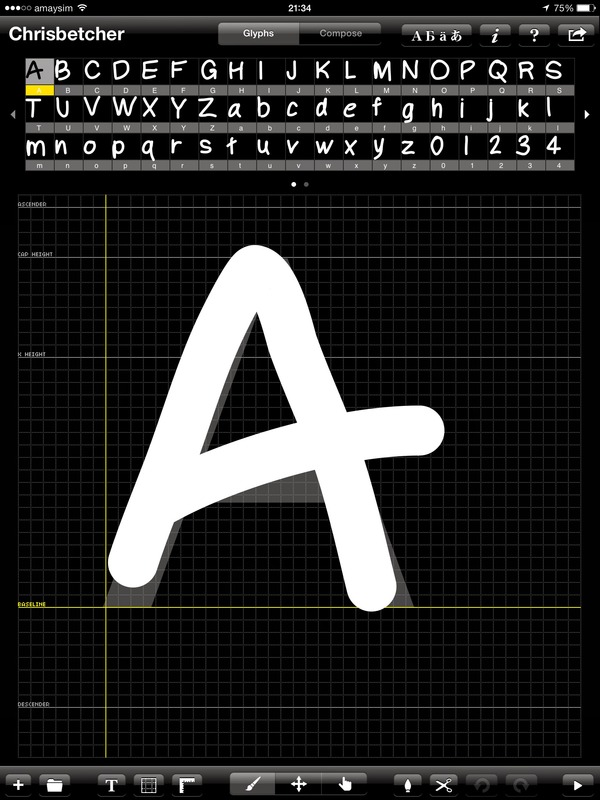 And of course, why not grab a copy of iFontmaker and have a go at making your own... It's really quite easy. Day 22. I was at Dragon Boat training this afternoon so I grabbed the iPad mini and used an app called iStopMotion to make a quick little video. Just another simple proof of concept video to show how easy it is to shoot stop motion stuff with an iPad. Day 21. Today I'm trying out a fun iOS app called Funny Movie Maker. It lets you pick a photo of someone or something, then place a part of your body (usually your mouth, though I suppose you could try other things) into the image to create these talking heads. I'm imagining that this app could be used in all sorts of fun and interesting ways by students. They could use it to explain concepts from a different viewpoint, pretend to be famous people talking about themselves, or just about anything else really. Like usual, these little daily create projects are just "proof of concept" pieces that could be extended into a much more sophisticated project. What would YOU do with a tool like this? Day 20. 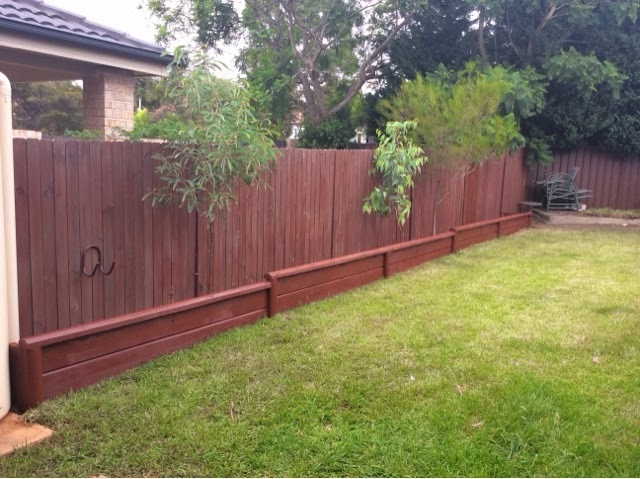 The first stage of our backyard makeover is done. After deliberating and procrastinating on our backyard for a very long time (literally years) we decided to make a start last week. We knew we wanted some sort of garden bed along the fence line, so I started with that. I'm sure the rest of the yard will unfold as time goes on. I really quite enjoy working with wood, being on the tools, and building stuff like this. It's much more creative than it might look because there's a lot of problem solving and figuring things out as you go along (at least there is for me... maybe I should plan more!) I just start with a general idea, and make it up as I go along. And yes, I know it still needs plants.... That's Linda's thing. Day 19. I spent most of today working on the backyard renovation (coming soon as a Daily Create hopefully) so today's effort is a fairly simple one. 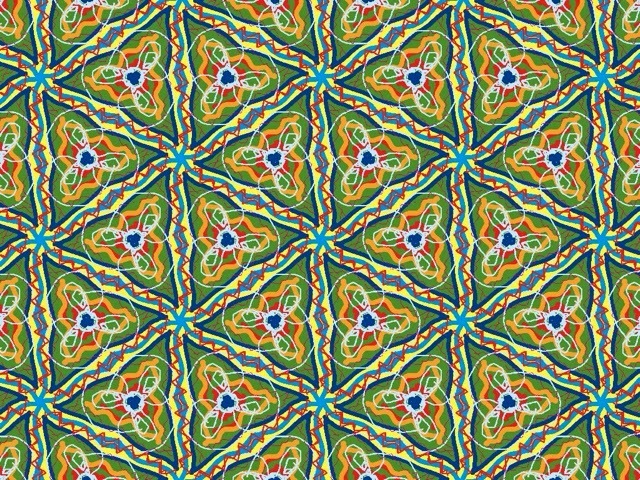 This pattern was made using an iPad app called Amaziograph. It's got several very cool symmetry and patterning options, just pick one and draw away... It would be very useful when teaching kids about symmetry, patterning, repetition, etc. Thanks to Cathy Hunt from the iPad Artroom for putting me onto this app. Day 18. With the very hot weather that we're experiencing in Sydney at the moment we decided to head down to Boat Harbour at Cronulla for a morning swim. It was a beautiful summer day, and the nice thing about Boat Harbour is that you can drive right onto the sand if you have an AWD vehicle. While we were there I took the GoPro out and shot some fun footage, then edited it later back at home using Final Cut Pro X. Nothing too fancy, I'm just trying to get my head around the workflows in Final Cut. So this is my creative project for today. PS: To my Canadian friends who are suffering through yet another Arctic blast at the moment, if you think I'm making these videos in a shameless and transparent attempt to get you to come and visit us down under, you're absolutely correct. :-) What are you waiting for? Day 17. 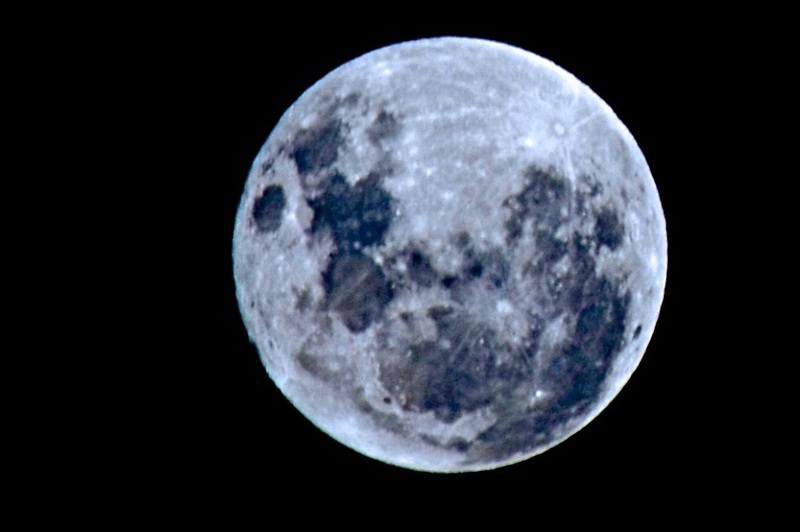 It was a beautiful full moon last night so I went out with my Nikon D7000 and tried to photograph it. I don't know if you've ever tried to take a photo of the moon but it's not quite as easy as you might imagine it should be. This was taken with a 300mm lens at f10, 1/500th, 800ISO. It's actually quite hard to focus on the moon at night; you have to do it manually and it's hard to see exactly when you have focus (especially with my eyes!) You also have to guess a bit with the shutter and aperture settings because the camera's metering system doesn't quite know what to do with a bright white disk on a large black background. I metered the first few shots but the results were completely blown out so I resorted to a bit of guesswork. I had the camera on a tripod and used a remote shutter release, but even then the images were pretty ordinary until I did a bit of post processing in Aperture. I mainly used the Curves adjustment to bring all the contrast levels back and restore some detail in the image. While it's not a technically great photo, I sure learned a lot about shooting the moon. Day 16. If you look back at Day 2 you will have seen a couple of rough sketches of ideas for a backyard renovation. Today's creative act was to start digging. 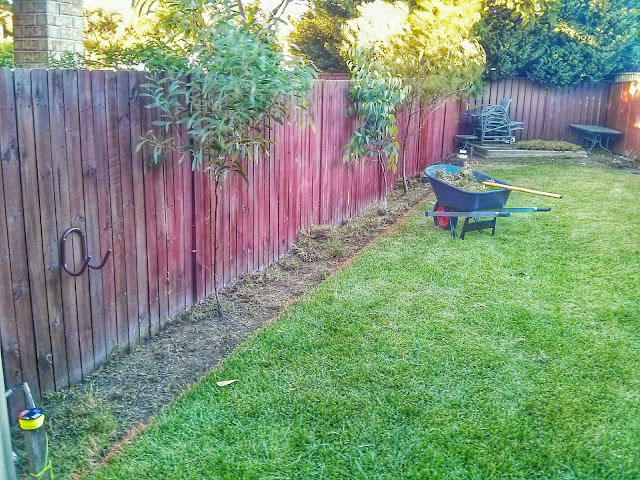 After buying a second hand wheelbarrow on Gumtree I marked out the edge of the garden bed and started digging a line for the small retaining wall it needs. If its missing coffee creamer. But their aisle shelf is bare. But they’re simply never there. when I saw them on the shelf. I am simply not myself! It’s simply not the same. and that branded Nestle name. So Woolies get your act together! I’ve tried that other stuff. I want, no NEED, my creamers! Three weeks is quite enough. Day 15. The backstory: My fiancé Linda loves her coffee, but only if she can have it with Nestlé coffee creamers. Just before Christmas they went out of stock at our local Woolworths store and are still unavailable. Needless to say, she's starting to have withdrawal symptoms. Short of jumping out of planes or skiing down huge mountains, what other things would be interesting to shoot on the GoPro? Day 13. Our new Education minister, Christopher Pyne, is not impressing me. So today's Create turns a recent radio interview he did on the ABC into a musical remix. To make this, I used Audio Hijack Pro to grab the audio from this interview, then I extracted individual sound bites from the audio track using Audacity, then remixed them using GarageBand. I chopped and remixed his original words, then added some bass and drums to turn it into what you hear here. In case you can't tell, I'm not a fan of the changes that Pyne is proposing, and I think he is somewhat of a fool who should keep his party politics out of education. If you'd like to have a crack at remixing this yourself, feel free to do so. I can even send you the original sound bites if you want them. Day 12. Today is a video I helped make that was produced by a team of Google Certified Teachers (and one actual Googler) answering some user-submitted questions about Google, its education products, and a glimpse into the future and what's coming down the pipeline. Day 11 - A few days ago I posted some gridded photo collages I made from my son Alex's Instagram shots. I got them printed up nicely using InDesign. The next part of the plan was to get them framed, but when I went to a framing shop the price I got quoted was outrageously expensive - about $600 for four frames! So today I went to a wholesale frame retailer and bought the frame kits and the custom mats and and framed them myself. The finished products look amazing! 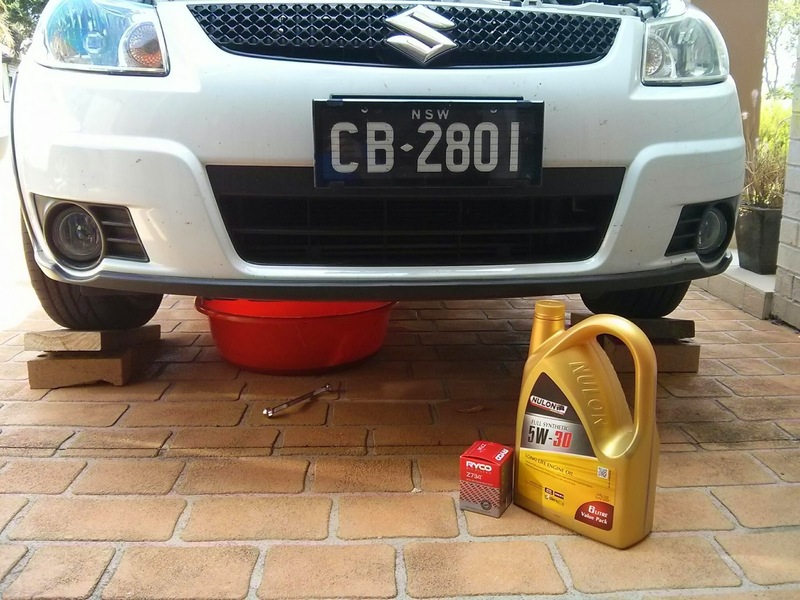 It really pays to shop around and if you can do some of the work yourself it saves a lot of money. The final price for all four frames was less than a third of the original quote, but I also really enjoyed cutting, assembling and finishing the frames myself. I'm not sure what you see as the creative act here... making these lovely framed prints, or making sure that I didn't get ripped off! The image above was created automatically from a series of photos by Google+'s AutoAwesome feature. Day 10, and we started with a visit to the beach this morning where I took a few photos by the shore. This one was shot and (over? )processed using SnapSeed on my Nexus 4. Day 9 and as promised here is how you make the image map I showed you in yesterday's post. I know this post looks a lot like the previous one, but yesterday was an example of an image mapped photo, whereas today is a video that explains how you can make one. I've never really done much with Google Drawings, it's been the underappreciated child in the Google Drive suite, but I've actually found a few cool things to do with it lately. Maybe I'll post more here as the year progresses. If you try it out and make one of your own, post it in the comments and share it back with us. Day 8. Today I'm posting a photo with an image map. Image maps are when you can mouse over different parts of the image and they act as "hotspots" that link to different URLs. If you click on individual people in this photo you'll find it will take you to their Google+ profile page. Image maps are not a new thing. I learnt how to make them way back when I started making webpages in the 90s using Adobe PageMill. But this one was made using Google Drawings and then adding transparent linked shapes to it. Tomorrow's daily create will be a video showing you how to make this. I hadn't really considered how these could be made so easily using Google Drawings. Thanks to my fellow GCTs Adrian Francis, Jay Atwood and Juan DeLuca for raising the idea on the GCT forums and prompting me to discover how to make these. What classroom uses can you think of for image maps? 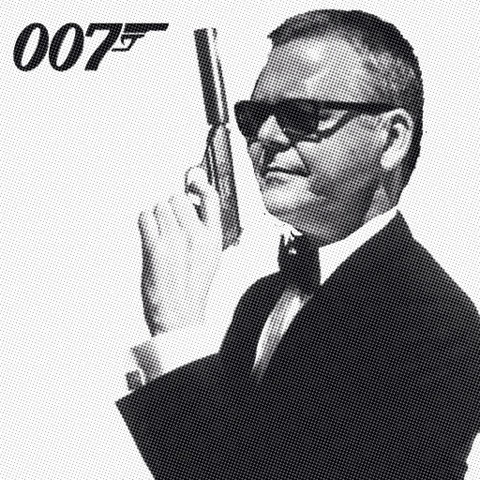 Day 7, and since I've been numbering the days using three digits, it means that today's daily create is 007. So I thought it fitting that I somehow include some reference to James Bond in here somehow. So this is me, as him. To make it I used Adobe Photoshop Touch on my iPad mini. Photoshop Touch is amazingly powerful for editing images, and includes more high end image editing tools than you might expect from a mobile app. If you could put your head on someone else's shoulders, who would it be? Day 6 and I'm trying to learn how to draw on the iPad. 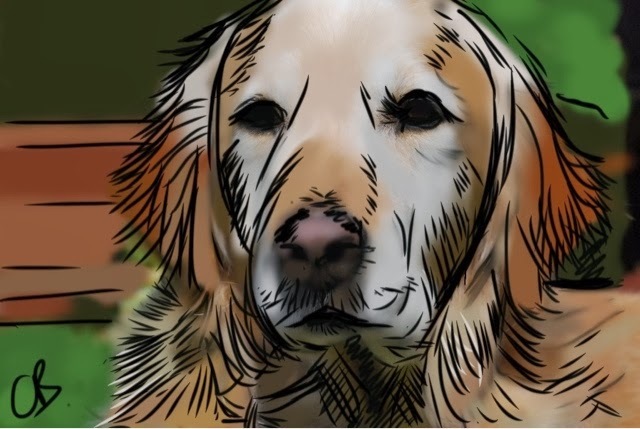 Using an app called ProCreate on my iPad mini, I created this sketch of our golden retriever, Buzz. I started with a photo I took, then imported it into ProCreate as a base layer, then created a series of other layers on top of that to gradually build up the image. I used airbrushes, smudges, ink pens and so on, to build the image in layers. It's probably not a brilliant final result but I learned a lot about picking colours, resizing pens, customising digital ink flows, etc, so I definitely know more about using ProCreate now than I did about 30 minutes ago! I can think of uses for this kind of layering technique for drawing with my students. How about you? Day 5. I don't know exactly what constitutes a creative act. But after this activity I will have created a cleaner engine with better fuel economy and that has to count for something. Seriously though, any time you do something for the first time, you need to solve a number of problems. For example, the red drain bucket would not fit under the car so I had to rig up a couple of ramps to raise the front end. To me, solving life's little daily problems is just as creative as a photo or a drawing or a poem. Different, but still a problem requiring a creative solution. Day 3 of the Daily Create challenge. My son Alex has spent the last 7 months travelling around the world, and will be home at the end of the month. As a belated Christmas gift I went through his Instagram photos and used some of my favourites to make him a series of collages using InDesign. I still need to get them framed, but I think they'll look good when they are behind glass. Day 2, and I've been thinking about some possible changes to our backyard. We've been saying for ages that we need to do something with it but something always seems to distract us from dong it. 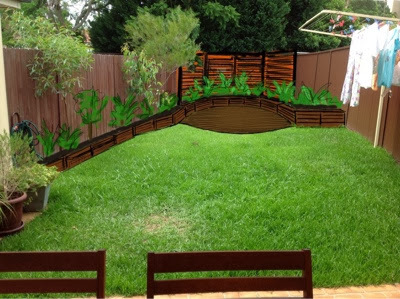 So in an attempt to move this forward, today I took a photo of our backyard on the iPad then used an app called ProCreate to add some layers and sketch a couple of ideas for the yard over the top of the photo. I'm not really sure if they will lead to the final design or not, but it's a start in thinking about it. And it's creation number 2 for Day 2. Got any suggestions for me? What would you do with the yard? Welcome to my Daily Create project for 2014. I've done a couple of "project 365" photo challenges over the last couple of years and have generally quite enjoyed doing them. I like the idea of challenging myself to have the discipline to do something every day for a year, and although taking a daily photo is fun, I thought it might be interesting to expand on that idea a little. I wondered what else I might do every day for a year instead of just taking a photo. So I asked for some advice on Twitter on what else might be good to do and I got lots of interesting suggestions. Thanks to everyone who offered an idea. In the end I decided to try and just do a "daily create". Make something every day for a year... it could be writing, a drawing, a painting, a song, a poem, a story, a blog post, a screencast, a video (and yes, I'm sure there will still be lots of photos). It could be a new recipe, a dance, an idea, anything... so long as I can make something new exist each day and somehow document it here on this blog. Life should be an ongoing act of daily creation. Each creative thing might be something born digital, but it could also be a real physical thing too. The important thing is that every day for a year I make SOMETHING. It's open ended. I could learn to do something, make something, be something. I can use whatever tools and processes I like. I'm pretty lazy so I'm planning on coming up with some ways to automate the process with things like IFTTT and other digital workflows. It should be interesting and a bit of fun. Original content is published under a Creative Commons 4.0 CC-BY-SA licence, 2014. Picture Window theme. Theme images by mattjeacock. Powered by Blogger.